How to Restore Image after Disaster via Free AOMEI Backupper? How computer system disaster happen? System disasters are unexpected. Nowadays, many people use computers for work or play every day, they may encounter system disasters for accidentally deleted of files or apps, virus attack, hardware conflicts, malware, sudden power off so, in a word there are various reasons to cause it but we don’t know which one. System disaster often comes with data loss, they may cause more troubles. What we can do is restoring image backup after a disaster to make up the loss as much as possible. Now many users know it is important to protect data with different methods, backup system and data in advance or regularly is one of the useful ways in case of system disaster. How to restore a system after a disaster? A copy of AOMEI Backupper installed on your computer. Create a system backup or disk backup before when the computer is unbootable. Create a bootable CD/DVD or USB flash drive with AOMEI Backupper inbuilt utility. This bootable media can be created by another Windows computer. If you are on the same LAN, you can use AOMEI PXE Boot Tool to boot the target computer without any bootable media devices through a network. How to use AOMEI Backupper to recover from a disaster? After testing, we like AOMEI Backupper’s cool and clear interface, and easy-to-use designs. AOMEI Backupper makes goal very convenient to achieve. Next, let’s see how it works step by step. Step 1. 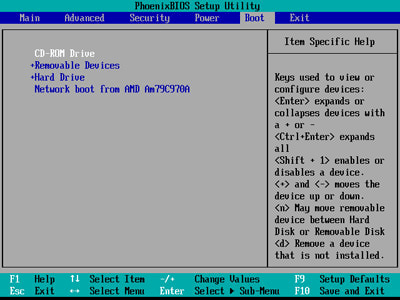 Change the boot order in BIOS. Choose bootable media or Network boot (if you prefer to use AOMEI PXE Boot tool) as the first boot device. Step 2. Click on the “Restore” tab, then click “Path” to browser an image backup file to restore. At last, click “Next” to commit the task. Notice that when specifying the image backup file the drive letters may be changed in PE environment later. Step 3: This is another way: select a backup point to restore if you have kept scheduled full/incremental/differential backup before, and then click “Next”. Check the option “Restore system to other location” if you wish or leave it if otherwise. 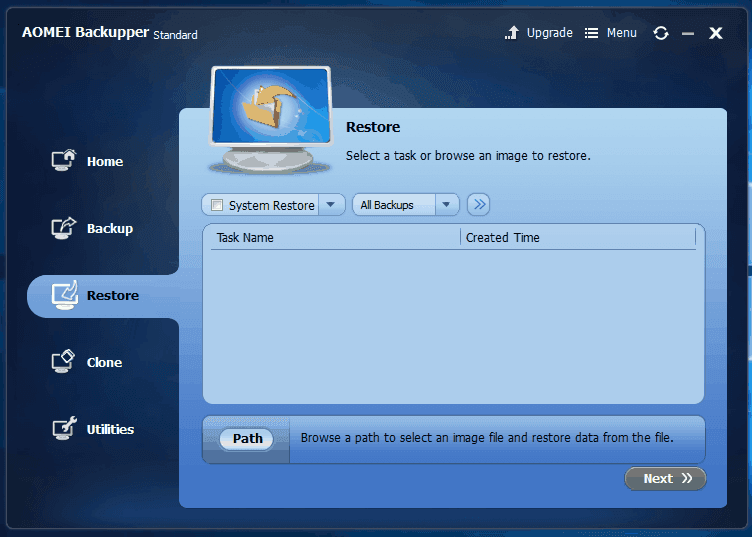 Step 4: In the operation summary screen, click “Start Restore” to run restore Windows image backup mission. Then the system restore will proceed. Be attention that if you have resized the partition backed up after taking the backup, the program cannot recognize the original location, so you need to manually choose a location to restore to. What’s more, AOMEI Backupper supports dissimilar hardware restore. Here you have learned how to restore image backup after the disaster with AOMEI Backupper Standard. When the restore process has done, you can close the software and boot your computer from the restored disk. By the way, another AOMEI product – AOMEI OneKey Recovery, which can create a boot option at startup allowing you to press a specific key(“A” button or “F11”) to boot into AOMEI restore the environment, you can restore your computer after a disaster without using any other devices.AOMEI OneKey Recovery only works for system backup and restore. 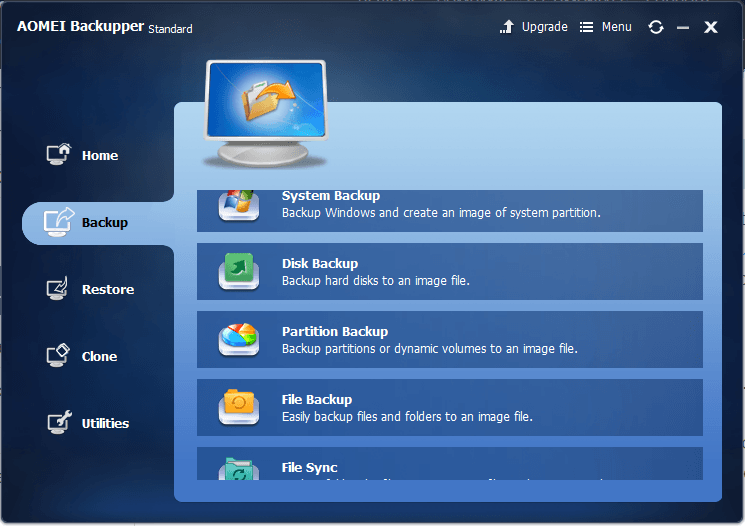 Well, AOMEI Backupper Standard is a free Windows backup software. Above we taught how to use it to do restore. You may wonder how to use it to do the backup, please read on. On “Backup” tab, you can start a backup task. AOMEI Backupper supports system backup, disk backup, partition backup, file backup as well as file sync. Each backup selection has only two steps. The first one is to select the target, the second one is to select the image storing location. Besides local hard drive, you can backup to external hard disk or NAS with AOMEI Backupper. Then there are other options to assistant the task: compression, email notification, comments, encryption, splitting, intelligent sector, VSS, schedule, scheme, etc. You see, AOMEI Backupper is easy to handle but has strong features. 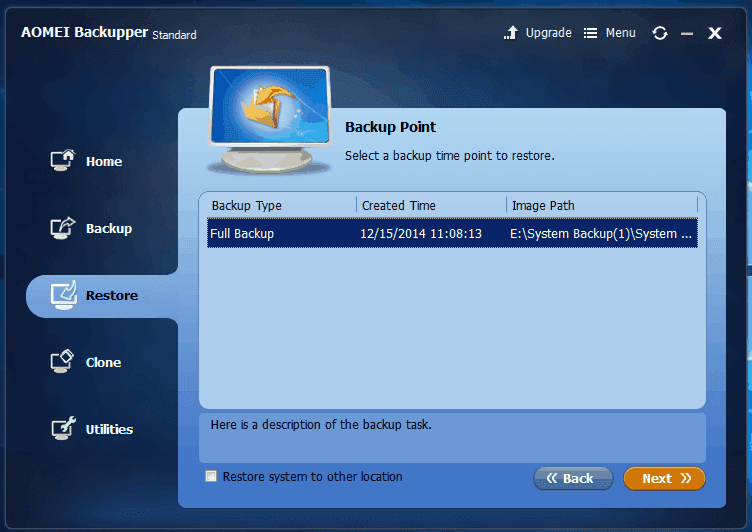 AOMEI Backupper is an all-in-one software, except backup functions, it has clone functions. Sometimes, backup or clone can achieve the same goal. 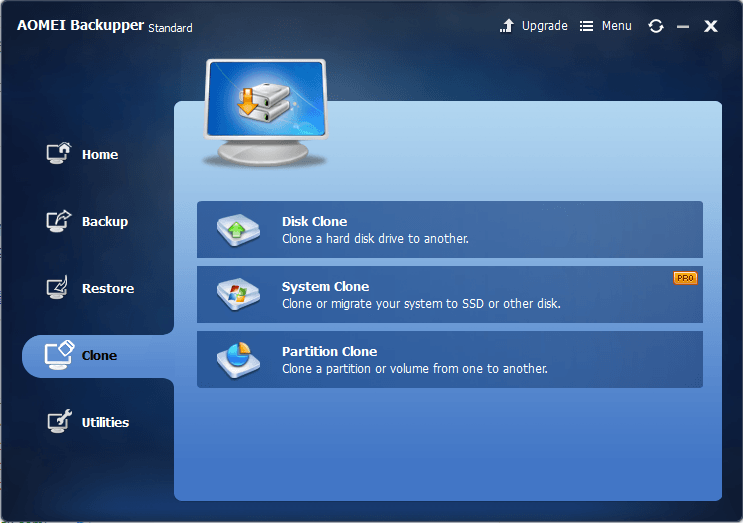 AOMEI Backupper has disk clone, partition clone, system clone. System clone also named migrate OS to SSD.When you buy a new computer or upgrade to SSD, you can unlock this feature. As a backup task, clone task has few steps, each step has guides, just follow them step by step to finish a task. Moreover, AOMEI Backupper has a series of utilities, we have mentioned PXE Boot tool and create bootable media tool, there are also check image, explore the image, merge image and so on. AOMEI Backupper has multiple languages support: English, German, French, Chinese, Japanese, Italian, Dutch, Spanish and Turkish. If there still has not your language, you can help them translate. AOMEI Backupper’s drop-down menu has “Help us translate” selection, just click it to contact the team. 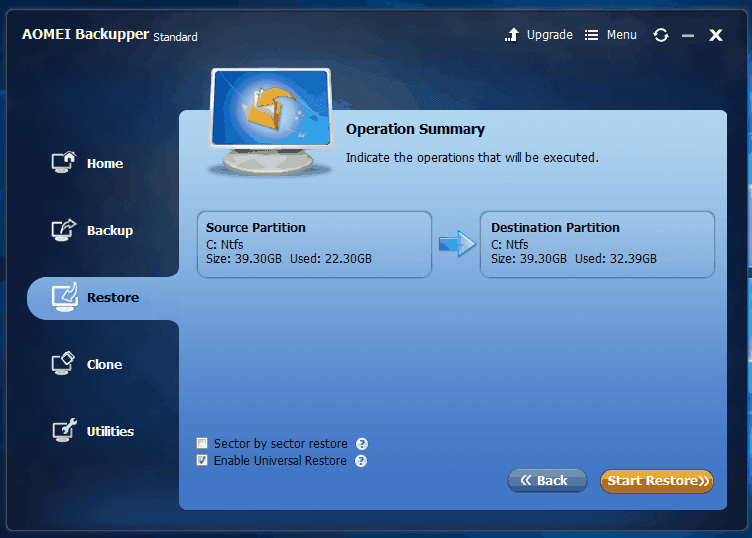 Standard Edition of AOMEI Backupper is a freeware used on PC, if you want to backup Server, you can upgrade to higher editions such as AOMEI Backupper Server, Technician or even Technician Plus. Now The latest version of AOMEI Backupper is 4.5 beta, this version added a new edition – AOMEI Backupper Network, you could also access it in Standard Edition’s utility tab. AOMEI Backupper Network is able to create and manage backup tasks for all computers in the network from one central management console, thus, AOMEI Backupper becomes centralized backup software.